We know developing the right lighting solution is complicated. We design and develop innovative solutions under production quality systems and controls, focusing on the complete value chain. Let us source the right technology saving you time and streamlining your lighting system development. Our expertise, lighting focus, and dedicated prototype lab allow us to save you time and money while reducing the overall project schedule. Our product development process, created over 30 years, helps you provide feedback at each iteration to ensure your project goals are met. We take a technology agnostic approach to design allowing us to source the right lighting technologies, creating innovative designs for better market adoption. We produce/assemble most of the lighting systems we design. We design lighting under production quality systems with manufacturability as a goal. We are constantly evaluating new technologies to help you decide from thousands of potential technology providers. Our process begins with understanding more about your lighting project. 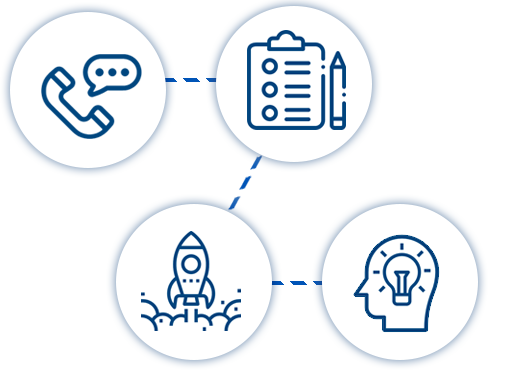 Once we have these details, we will set up a discovery call to understand your goals and key objectives for your project. As soon as we know your needs and understand how we can help you, we will provide you with a statement of work (SOW) for your review. The SOW will state our deliverables and we will review the stages of our product development process. From there, we will hold a kick-off meeting with all project stakeholders and our illumination experts and we will begin our product development process.